When I was first learning to play pool, there were only two or three different brands of pool cue chalk. Back then, chalk was chalk and you usually just grabbed any cube that was close by. Occasionally you’d get lucky and find a special piece that just played perfectly, so you’d go to great lengths to stash and protect that piece while hoping that it would last forever. Today there are more chalk options than you can you can shake a stick at, and with such a large selection to choose from it is now much easier to find quality pool cue chalk. 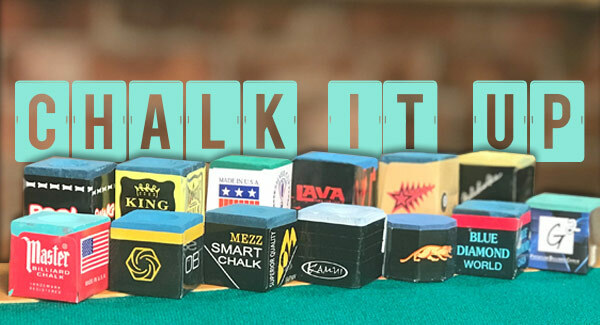 What Pool Cue Chalk Do the Pros Use? My friend and Hall of Famer Nick Varner once told me “there is still nothing like a good piece of blue Master chalk.” Master chalk is the ol’ reliable option made by Tweeten in Chicago where they’ve been making billiard chalk for over a century. This stuff is great, and chances are it’s what’s sitting on the rail of the tables at your local pool room right now. Another popular brand is a favorite of top European player Neils Feijen. Neils prefers Blue Diamond chalk made by Longoni. This chalk is a great value and is considered by many to be the original “performance chalk”. Blue Diamond comes in packs of two and those cubes are incredibly consistent. They seem to always feel like that perfect piece! Personally, I side with Champion player Darren Appleton when I say that Predator is my favorite brand of pool chalk. This is a dry, gritty chalk that has great adhesion to the tip yet doesn’t seem to get all over the cue ball. This chalk is octagonal too, so it has a really unique feel in your hand. Predator chalk comes with five pieces per tube (for under $10) so there is plenty to go around. Frank Says: "Because Predator chalk is an octagon, you need a special chalk holder! Check out our package deal on a pack of Predator Chalk and a Chalktagon!" The top-shelf option that professional players, including Hall of Famer Mika Immonen, swear by is Kamui Chalk. This chalk isn’t cheap (close to $30 per cube), but it sure does its job when it comes to tip adhesion and grabbing the cue ball. Many players like using Kamui chalk because they say that it allows them to only need to chalk once a game. How to Apply Chalk The Right Way! Minnesota Fats once quipped that he could tell which players were tops in a room just by watching them chalk their cues. He meant that if you look around the pool room, most of the top players will brush the chalk onto their tips, making sure the entire tip is covered, guarding against a miscue that could cost them the game. Most beginners and amateurs, on the other hand, will grind the chalk onto their tips, like they are trying to drill a hole to the bottom. Grinding does not get you a good coverage of chalk on your tip, and it tends to make a gigantic mess of chalk dust all over the table. This leads in perfectly to my final piece of advice on chalk which is a simple takeaway but will prevent you from being “That Guy” nobody wants to be. Please, please, please DO NOT PLACE THE CHALK FACE DOWN on the rail. No one wants blue hands, clothes or the mess that comes from placing the chalk face down on the table.